I've stuck to vegan choices, with a couple exceptions (like ranch dressing a couple times) and so far I've lost ten pounds. 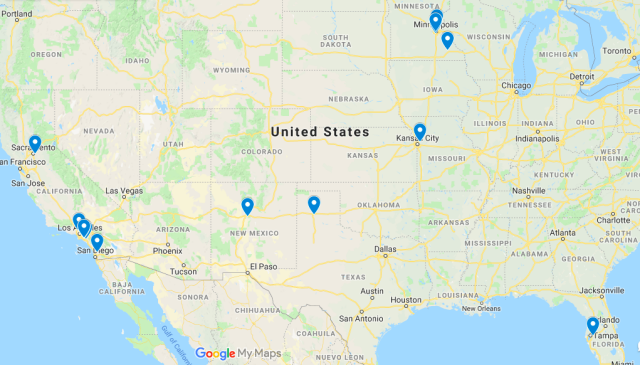 Here's a map of all the locations I've visited. This is the week of the Laughlin Laugh Fest - I'm performing in the Rising Female Stars show on Saturday. The rest of the days will be filled with seminars and more shows. Really looking forward to this festival. No blog posts in forever. I need to set an alarm or electric shock or something to remind myself to post here. I'll be traveling to two comedy festivals in October, The Laughlin LaughFest in Laughlin, Nevada - and then on to the 10,000 Laughs Festival in Minnesota on the 24th. So excited to see friends and family in Minnesota! Where have I been? Not blogging apparently. I just got home from my first trip to Arizona. We did shows at two fantastic clubs, the Tempe Improv and Laffs in Tucson. Met some great people there, a few displaced Minnesotans, and had a really fun time. One is for Korean TV, and the other may just be online. I'll post links if/when I get them. And, I just found this clip - apparently I was added to one of the Comedy Time TV episodes last month. My group of funny ladies "The Real (funny) Housewives of Rio Linda" is performing tonight at Momo Lounge in Sacramento, 7:00 pm. I've had an amazing couple of days down here in Southern California. I got two pieces of great news as I was driving into town: I found out that I got a set at the Chocolate Sundaes show at the Laugh Factory in Hollywood, and I was cast in a commercial for Intel. I actually got to do two sets at the Laugh Factory which was so much fun. Always a great show with fantastic crowds. Go see Chocolate Sundaes, you won't be disappointed. Then on Monday we taped the commercial. I got to play a bitchy wife - I know, what a stretch! Pretty sure I nailed it :) It should be online soon, I'll post the link as soon as I have it.